From environmentally friendly lawn care to gourmet cookery with foraged foods, the presentations at the Living Local Harvest Festival on Saturday, Oct. 1, were packed with information and inspiration, and none more so than the “Prize-Winning Compost” workshop. Even the most discouraged and perennially unsuccessful home gardener could not have left without high hopes for next year’s growing season. Like good compost itself, the captivating presentation was a rich mix of facts and anecdotes, motivation, and education from diverse sources and experiences. For this writer, whose compost bin holds an unsavory stew of decomposing kitchen scraps, routinely ravaged by burrowing vermin, that never makes it to the gardens, the panel talk was strong incentive to mend our ways and feed our soil right. “I’ve been organic gardening for 50 years,” declared the legendary Paul Jackson of Edgartown, who has gained local fame for the awe-inspiring bounty of his land. Even listeners who had never been able to grow a decent radish couldn’t help but start fantasizing about better days. Mr. Jackson told how he had reclaimed the sandy, unusable soil at the home he bought years ago using an unorthodox mixture of easy-to-come-by organic matter — leaves, fish, seaweed, scallop shells, and, more recently, horse manure. “A lot of people told me I didn’t know what I was doing and the gardens wouldn’t amount to anything,” he recalled. But skeptics ate their words and doubts as the Jacksons feasted on an ever-increasing abundance of plump tomatoes, peppers, eggplant, and squash, straight smooth carrots, potatoes, and beets, lush green vegetables, along with apples, pears, berries. “We very seldom go to the store,” Mr. Jackson remarked. There are no accidents at the Jackson farm. Even the scallop shell driveway is located close enough to the garden that dust from the shells blows onto the soil, adding nutrients. Year after year, adding new elements to his compost, trying new things, his soil grows richer, his plants bigger and more lush. He has harvested 20-pound cabbages, and his pepper plants sometimes grow three feet tall. At this year’s Ag Fair, Mr. Jackson won second prize in the compost competition. 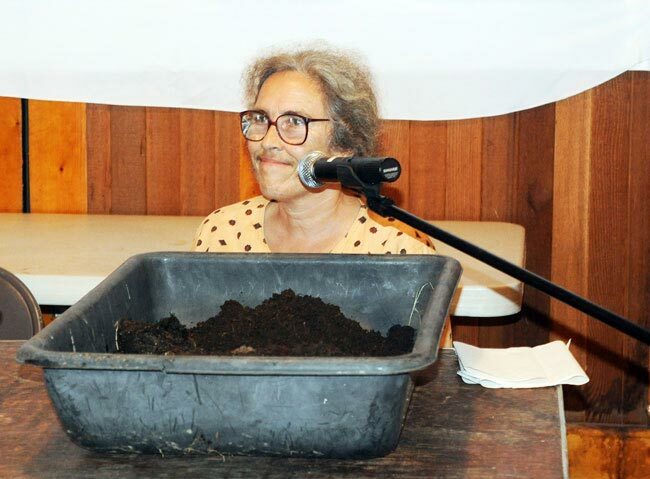 With her characteristic warm smile, Ms. Gilbert demystified the often daunting picture of compost, personifying it and bringing it to life. She compared successful compost to a “good strong neighborhood” where a multiplicity of individuals offer an array of skills and talents. She later stressed that most of the credit for the farm’s compost must go to her husband, Randy Ben David. As a judge for the Fair’s competition, farmer/gardener Chris Riger offered some important facts. He reminded the audience that although experimentation is inevitable, there are basics of successful composting. “They really aren’t arguable,” he said. Topping that list is having the correct balance of carbon and nitrogen in order for the material to break down. Mr. Riger described the Island Alpaca Farm compost, which won third prize for Philippe Morin at the Ag Fair. The rich, nutritious product is unusual in using a single organic source — nitrogen-rich alpaca pellets, which Mr. Riger described as “little discreet packages of manure.” Because they are small and can dry out and harden, Mr. Morin ingeniously layers them with damp cardboard which adds necessary carbon and moisture and encourages earthworms. The farm sells bags of the manure as “Alpaca Gold,” and Mr. Morin’s prize-winning soil enhancer shows the name is well deserved. After deluging the experts with questions and appreciatively running their fingers through the prize-winning composts, listeners reluctantly headed home, visions of dark, aromatic compost and happy green plants dancing through their heads. Chris Riger and Phillippe Morin have launched the Island Cooperative Compost Project with the goal of increasing the quality and quantity of compost made here. The project aims to connect interested gardeners, provide education and information, and, more ambitiously, begin a large-scale community composting project making use of a variety of now-unused organic wastes. For information, visit mvcompost.wordpress.com.